I’ve viewed many disease-of-the-week films over the years, but nothing prepared me for the intensity and brilliance of STILL ALICE (2014) starring Kristen Stewart, Julianne Moore, and Kate Bosworth. This movie could have easily evolved into a boiling pot of sentimentality. 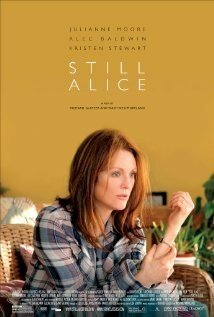 Instead, STILL ALICE held our hand and led through an Alzheimer’s diagnosis with compassion, intelligence, and just the right amount of tears to help us release the pent up frustration. As a celebrated linguistics professor, loving wife, and mother of three, Alice Howland is devastated to learn she’s suffering from early onset Alzheimer’s. Simple tasks become impossible feats, and when her husband finds himself unable to relate to the woman no longer resembling his wife, Alice channels her energy in an attempt to connect to her grown children if only for one last moment in time. Struggling, she battles to retain even the simplest of memories while her brain appears determined to let everything that ever mattered just slip right out of her hands. Interestingly, co-director R. Glatzer suffers from ALS and completed his directorial duties with a ‘text to speech’ app on an I-Pad which might account for the movie’s ability to take us right up to the edge without indulging in mawkish dialogue. Extended monologues would have served no purpose, and Julianne Moore’s performance is the perfect example of an experienced actor researching the role and understanding every nuance of her character’s condition. Kristen Stewart who you might remember from THE TWILIGHT SAGA (2008-2012) plays her standard character—the disheveled, uninspired, and antisocial twenty-something. Directed by Richard Glatzer and Wash Westmoreland, Rated PG-13, 99 Minutes, Drama, ****4 stars out of 5. Don’t be surprised to see STILL ALICE pop up on the 2014 Academy Awards nomination list for best drama.